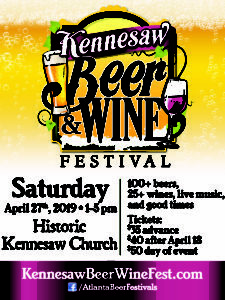 The 2019 Kennesaw Beer & Wine Fest at Depot Park – Saturday, April 27, 2019 1-5 p.m.
Atlanta Beer Festivals and the Kennesaw Downtown Development Authority hosts this event for the 6th time. 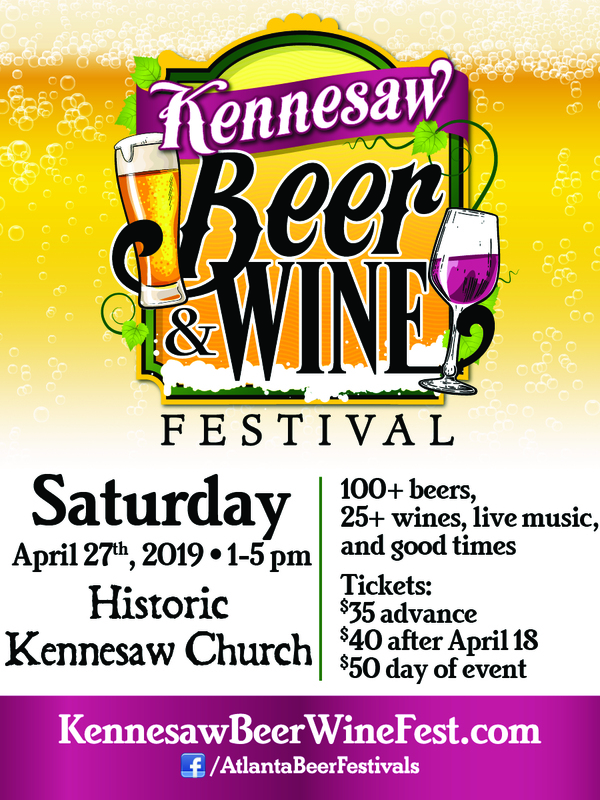 While the Depot Park is being renovated, this event will take place in the parking lot area of the Historic Kennesaw Church across the street from the park. We will have over 100 beers, featuring the local Georgia Breweries, and a select number of breweries from all over the country. This event will also feature over 25 wines, and a bunch of ciders as well. Lazy Guy Distillery will join us to taste small samples. A full list of beers, wines and ciders will be posted the week of the festival. We will have some fun attractions this year, including live music on the main stage. Be sure to RSVP to the Facebook event page to get all of the updates. Tickets are $35 advance, $40 after April 18, and $50 day of the event. Your ticket price includes a souvenir cup, entertainment, and all of your beer samples. There will be a Designated Driver Ticket available at the gate on event day for $15. Food will cost extra. This is a 21 and up event, no exceptions, no kids, no babies, no pets. Rain or Shine, no refunds. Beer will cut off at 4:45 p.m. We will have FREE bottled water available. There is no parking at the venue, and only limited street parking available, so we encourage other forms of getting to the event, like Uber, Lyft, a cab, or walking. Click on the Directions tab for more info.